Yesterday I had a conversation with a long-time horsewoman that touched on all aspects of horse/life. Both of us have ridden spectacular horses and both of us work with horse rescue, so our talk ran the gamut of sublime to horrific. There are images in our minds that we will never forget; some of perfect moments of oneness and some are forever haunting and too ugly to name. Both extremes are reflected in their eyes. That old adage that eyes are the window to the soul–never gets old to me, so I doubt I will ever stop with the eye photos. I know I use them a lot, but their depth always draws me close. That, and white eyelashes. ← Small Lives, Literary Aspirations. Thanks for commenting. When I give lessons, I always stare at the horse’s eye, to know how I am doing. I think you are “hearing” that way, too. Love the eyes, too. This photo looks like our mare, Faith, a rescue. Who know what she experienced, but she has scars all over her hind legs and hindquarters. It has been interesting watching her eyes change over the year we’ve had her – from dull and resigned to bright, curious and mischievous. Never stop with the eye photos! Sounds like your eyes change as well, not that you ever doubted her. Different every day, right? Thanks. 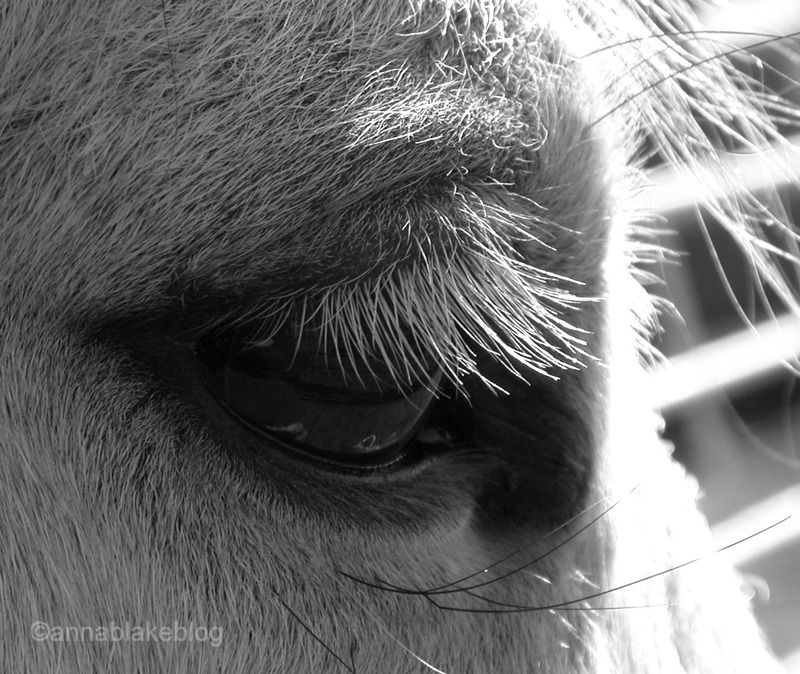 Anyone who loves horses will never tire of looking into or at a photo of the eyes. I’m starting to think everyone might have it as bad as I do. Horse people, gotta love ’em. Thanks. It was the intense stare of a troubled mare over a period of months, three years ago, that drew me to her. One long look seemed to be an entire conversation. Today it is the soft and even playful same eyes that draw me to her. And that has developed into a love that has changed my life. Keep up the photos and those eyes. Fred, I just love thinking about you and your mare… you two are still my heroes. I must admit it is a special story to live and share. And best part is a lot of experienced horse people have learned something from us. It is all about trust and you can see that first in the eyes. I enjoy your photography and observations. Thank you for your efforts. i never tire of your photos of horses eyes. So much to tell in those eyes. My own horse has told me the story of her life in her eyes. Sometimes it takes me a while to understand, but not all the time. She paints a pretty clear picture!